What do Azure AD Connect and SDS do and how can they work together? Azure Active Directory Connect (AAD Connect) syncs on-premise AD Users, Groups, and Objects to Azure AD (AAD) in Office 365. 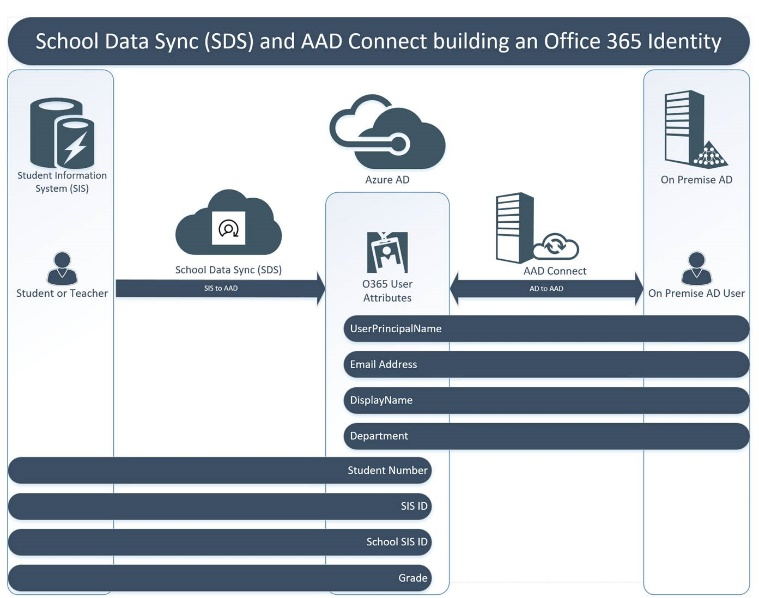 School Data Sync (SDS) syncs additional Student and Teacher attributes from the Student Information System (SIS) with existing users already synced and created by AAD Connect. Adding Student and Teacher attributes evolves the identity and enables apps to provide richer user experiences based on these distinguishable attributes and education personas. SDS allows you to automatically create Class Teams within Teams for Education, School based Security groups for Intune for Education Device policy, OneNote Class Notebooks, and class rostering for 3rd party application integration. AAD Connect and SDS will never conflict, as SDS will not sync or overwrite any attribute managed by AAD Connect. SDS also provide the option to create new users, so if you don’t want to sync and create them with AAD Connect from your on-premise AD, you can use SDS to sync and create them directly from your SIS. Both AAD Connect and SDS also sync and create other object types, like Groups, Administrative Units,and Contacts, but unlike Users, these object types are not combined to form individual and unique objects in AAD.